An RAF Officer selected as the first Chief of the Defence Staff’s Scholar has graduated with distinction from the University of Exeter. 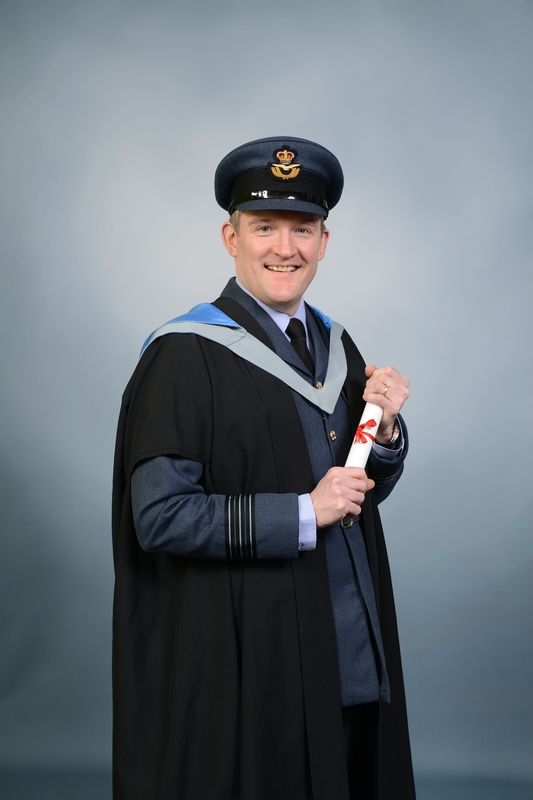 Wing Commander Mal Craghill was selected as the CDS Scholar from a group of MOD personnel undertaking the inaugural MA Applied Security and Strategy (MStrat) at Exeter’s Strategy and Security Institute, where he had been awarded a place through the Chief of the Air Staff’s Fellowship scheme. Besides the MOD students the MStrat cohort of 28 included recent Bachelor’s graduates as well as mid-career professionals from diverse backgrounds, nationalities and career streams. Exeter’s Strategy and Security Institute, led last year by Professor Paul Cornish and Lt Gen (Ret’d) Sir Paul Newton, offers the MStrat as a unique and innovative approach to the study of strategy in the contemporary security environment. Alongside a core programme of lectures and seminars, students undertake crisis management simulations, field trips and conferences as well as presenting their own policy frameworks for the UK’s engagement with real world challenges. In the latter case Wg Cdr Craghill led a group investigating the UK’s approach towards Iran, culminating in a presentation to Whitehall policy-makers at the Royal United Services Institute in London. The MStrat, taught by dedicated faculty as well as a wide array of internationally renowned academics and practitioners, pushes students well beyond traditional academic boundaries and sees them producing blog posts, op-ed articles and think pieces, policy briefs, options papers and evidence submissions to Parliamentary Select Committees as well as more traditional essays and literature reviews. Topics range widely, covering areas such as the role of the private sector in delivering national strategy, scrutiny of intelligence and security agencies, and drawing lessons from historical case studies. The final MStrat deliverable is a dissertation on a strategy or security related topic; Wg Cdr Craghill’s research took an inter-disciplinary approach to remodelling conflict prevention in fragile states, applying lessons from crime prevention to suggest a revised approach to the UK’s strategy for intervening in the developing world. He is now putting the MStrat into action in the MOD’s strategic headquarters, formulating policy and plans in the Defence Engagement Strategy team. Photo: Wg Cdr Craghill graduating from the University of Exeter’s inaugural MA Applied Security and Strategy. “On a drab and grey Friday afternoon in March we found ourselves standing in a hedgerow next to a farm looking at a large-ish copse at the far end of a field. Except it wasn’t a hedgerow, it was the forward-most trench of the German Strongpoint defending Serre village on the morning of 1 July 1916. And the copse wasn’t one large copse but four smaller ones – known as Matthew, Mark, Luke and John. This was the left hand flank (the German right) of the British attack on the infamous first day of the Battle of the Somme where the British Army, largely made up of Kitchener’s volunteers formed into Pal’s Battalions, sustained nearly 60,000 casualties in a single day. Over the course of the weekend we worked our way south, visiting the battlefields around Serre, Beaumont-Hamel and, finally, Thiepval where we laid a wreath from the students and staff of the Strategy and Security Institute at the imposing memorial. A dozen of intrepid MStrat students took the opportunity of being in France to tour the battlefields. Whilst many of us had been before, Professor Newton situated the battle in its wider strategic context and gave us a different view of the Great War. Even if he did have a particular interest in resurrecting the reputation of the Generals… It was interesting to see the extent to which our understanding of what happened in the trenches is coloured by myth. The portrayals of ‘lions lead by donkeys’ in films and TV shows like Blackadder and Oh What a Lovely War have had a lasting impact and overwritten what may be a more accurate portrayal of strategic leadership in 1916. 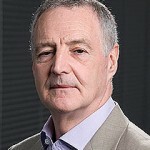 Kevin Myers, an Irish historian and journalist, took up this theme of building a myth as he explained how those Irish who fought with the Allies, have been written out of Irish history by successive waves of politicians and academics – despite many of the soldiers being Nationalists themselves. The power of this narrative is striking, and fascinating how it endures a century on. For all the understanding we developed of the wider ‘picture’ surrounding The Great War, you cannot escape the pathos of rows of, immaculately kept, white gravestones. Many of the graves, particularly at ‘Sunken Lane’ the forming up point for the attack on Beaumont-Hamel, stood in clusters – in the beaten zones of the German heavy machine guns. It does not take much imagination to visualize the ranks of men trudging across No Man’s Land and what they must have gone through. “Having been to the First World War battlefields on a school trip almost a decade ago, as many thousands of children will do so over the coming years to mark the anniversary of the conflict, a few recollections of the Somme stood out – bad weather, the perfectly conserved cemeteries dotted about the countryside, the vast expanses of openness, story after story of seemingly futile attempts to break the German line and, embedded in the psyche, the striking Thiepval Memorial. This SSI trip now as a (hopefully) more observant MA student and soon-to-be platoon commander, confirmed these memories but also did much, much more. Perhaps unsurprisingly the ability of General Newton to tie tactical, operational and strategic elements of the Somme together, along with the stories of individuals that really bring a battlefield tour to life, was remarkable – his descriptions of enfilading fire and beaten zones were somewhat more convincing than the valiant efforts of Miss Smith nine years ago. Likewise Kevin Myers powerful inputs on the myths surrounding the Somme were important in helping aid our understanding of the post-war narrative of the battle, and appreciating its place in British history. The MStrat course recently undertook a field trip to Brussels and Mons between Tuesday 18 and Friday 21 March 2014. 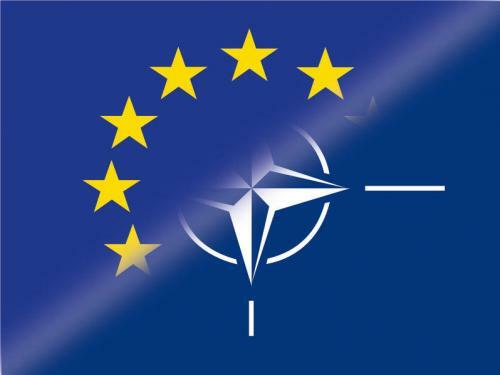 To gain an understanding of the institutional structure, policy-making and crisis-management processes, and main policy issues pertaining to the North Atlantic Treaty Organization (NATO) and the European Union External Action Service (EEAS). To gain a non-NATO/EU perspective on the crisis in Syria, the Balkan region and Russia-EU relations, by visiting the Russian Permanent Delegation to the EU. The MStrat trip was led by Dr. Sergio Catignani and accompanied by Dr. Daniel Steed and Ms. Roo Haywood-Smith. The MStrat cohort visited NATO Headquarters where Mr Jonathan PARISH, Deputy Assistant Secretary General of the Defence Policy and Planning Division, spoke on the current political agenda and the future of NATO as well as on the key themes that the next NATO Summit in Wales will deal with this September. Moreover, Mr Patrick ANDREWS of Crisis Response Systems and Exercises, Operations Division gave a detailed presentation on NATO’s Crisis Management Operations and how NATO was currently reacting to the crisis in Ukraine. Following the NATO Headquarters visit, the MStrat cohort was hosted by the Egmont Institute (The Royal Institute for International Affairs) in the Prince Albert Club, the Belgian Armed Forces’ All Ranks Club, where Professor Sven Biscop and Brig. (Ret.) Jo Coelmont gave respectively presentations on European Security and European Defence prospects during the “Age of European Austerity”. 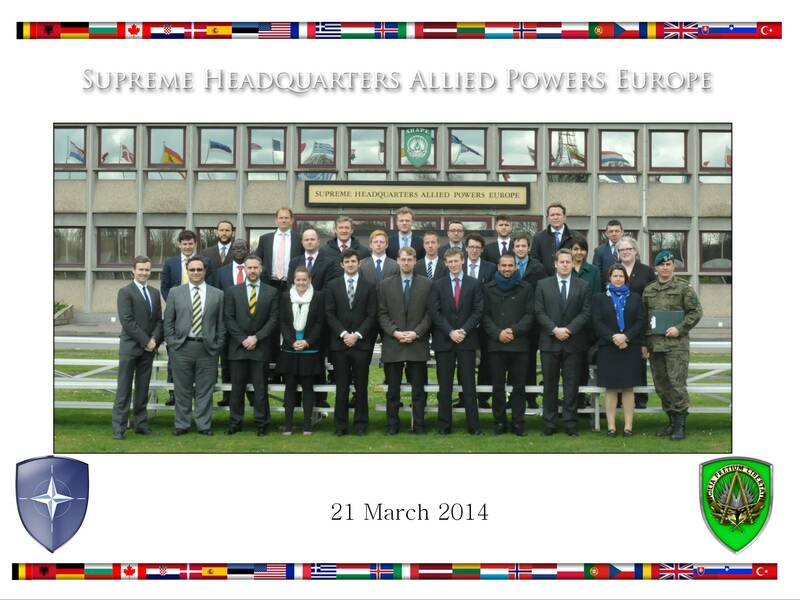 The following two days saw the MStrat cohort visit the European External Action Service where, among others, Brig. Gen. Philippe Boutinaud, the Director of Cabinet of the European Union Military Committee Chairman, spoke on the EUMC’s role and decision-making processes and challenges particularly during international crises. Ms Joëlle JENNY, Director for Security Policy and Conflict Prevention, also gave a very insightful presentation on the ways in which the EU seeks to improve conflict prevention in global affairs particularly through upstream engagement activities and programmes. At Supreme Headquarters Allied Europe, the MStrat cohort received several briefings including one on the workings of NATO’s Comprehensive Crisis and Operations Management Centre as well as how NATO is trying to improve its capabilities and activities relating to the comprehensive approach to conflict prevention and conflict resolution processes by British Army Brig. 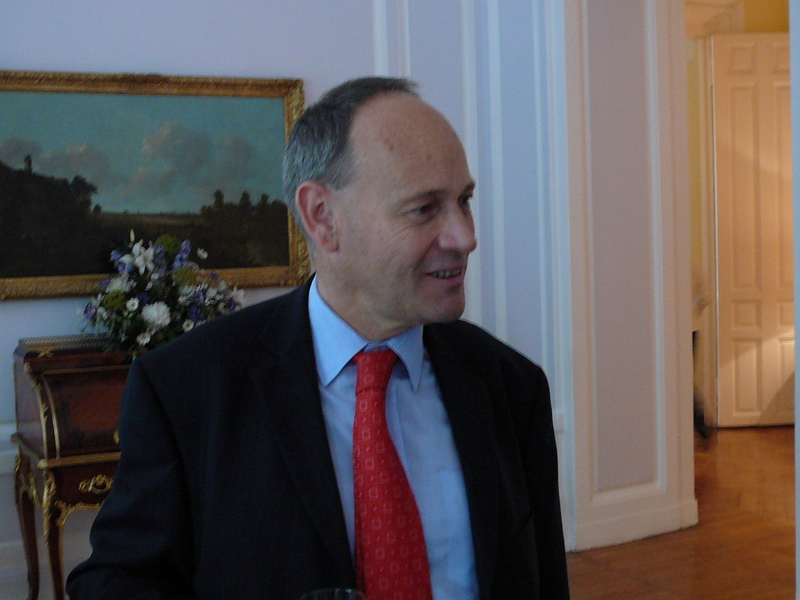 Gary Deakin and Dutch Ambassador Hans Wesseling. It also received a detailed briefing by a member of the European Union Staff Group on the EU’s “Operation Althea in Bosnia Herzegovnia” in order to prepare students’ for the next MSrat cohort trip to Bosnia Herzegovina, which is scheduled to take place in May 2014. The MStrat delegation also had the unique privilege of receiving a detailed and lengthy briefing by the Deputy Supreme Allied Commander, General Sir Richard Shirreff, on the challenges that NATO countries face over the coming years. He also spoke at length on the Ukraine crisis and the key decision point that NATO countries face today as a result of Russia’s illegal annexation of the Crimea. His comments on the Ukraine crisis were especially poignant given the fact that the previous day the MStrat cohort had visited the Russian Federation’s Permanent Representation to the EU, where the Deputy Permanent Representative, Mr. Sergey Kopyrkin, provided a Russian perspective on issues such as the Ukraine and Syrian crises and the Russian Federation’s future relations with the EU and its constituent member states in light of the Ukraine crisis. This week SSI Director Sir Paul Newton will help teach on a John’s Hopkins University field trip to France where US students led by a Prof Eliot Cohen will explore the causes and conduct of the First World War. In the centenary year of the outbreak of the ‘Great War’, serious students of applied strategy still have much to learn from this tragic failure of the international system. The following week, Exeter MStrat students will conclude their visit to the EU and NATO HQ in Brussels with a 48 hour field trip with Prof Newton and Irish journalist Kevin Myers to the Somme battlefield. The SSI/RUSI partnership really came into its own again when Prof Mike Clarke led a discussion recently on strategy during the Cold War. The RUSI-SSI partnership adds a distinctive, sharp policy focus to the MA programme. Later in the week, senior RUSI staff member and SSI Hon Prof Jonathan Eyal set out the causes of the Bosnia conflict. This provided a firm foundation for the MStrat field trip to Sarajevo in June. After the field work, SSI students will meet Lord Paddy Ashdown who played a key strategic leadership role in the Balkans: in that session they will jointly assess the prospects for security and stability in a volatile Region that, despite falling from the media headlines, is still critically important to European security. 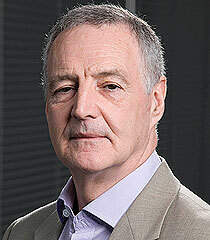 Former British Ambassador to Moscow, Sir Tony Brenton, visited SSI this month. He talked with MStrat students about unfolding events in Ukraine as well as about his experience of strategy under pressure, drawing upon his time in Washington D.C. in 2004. Brenton, then the No 2 in the Washington Embassy, saw at first hand the way the Coalition’s assumptions and plan for Iraq unravelled. 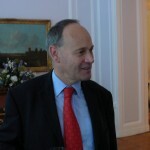 Sir Tony, a member if the SSI Honorary network later joined students for further debate over drinks and supper. It is in such informal encounters that much of SSI’s experiential learning occurs. Is the academic field of International Relations losing out because it doesn’t embrace foresight thinking? What can we do about it? If you have 5 minutes to share your views and thoughts, read on and fill out the survey: HERE. This year, at the International Studies Association 2014 Conference, we are hosting a Roundtable on the practice and pedagogy of strategic foresight in International Relations, entitled: ‘Bridging the Gap : The Art and Practice of Strategic Foresight in International Relations‘. The purpose of this Roundtable is to bring together International Relations scholars and practitioners to discuss the role of strategic foresight in international relations and to strengthen the community of interest to take this endeavour forward. To prepare for this Roundtable we are conducting a survey on the practice of strategic foresight in international relations – and seeking your views on this issue. Strategic foresight approaches, when incorporated into long-term planning processes, can have significant impact on international policy-making. Looking beyond present challenges and opportunities to those on the horizon is arguably an indispensable and necessary role of government especially in the foreign policy realm. At this time of geopolitical uncertainty, there is growing interest in this approach to understand developments in the spatial dimensions of foreign policy. Yet foresight has a strangely marginal position in the International Relations academic sphere and is largely absent from most International Relations faculties and courses. However, it is arguably a discipline worth being taught and studied in universities. The strategic foresight toolkit is growing in use by foreign policy practitioners, including diplomats. And research would help clarify and focus on debates about good practice and the effectiveness of strategic foresight in influencing decision-making. By hosting a Roundtable on this issue, we will be exploring the importance of strategic foresight and the challenges it faces in the school of international relations. We will be discussing the contribution of scholars to foresight in international affairs, debate the value of the endeavour, and share examples of effective approaches and projects. This survey will collect views from a wider group of people prior to the roundtable – and is being launched on World Futures Day on the 1 March, a day to celebrate the possibilities for transforming the future and an opportunity to open dialogue on these issues. You can get involved now by filling out this survey and contributing your views to the debate. The results of the survey will be discussed at the Roundtable and incorporated into an associated report. Alphen, Netherlands. 3 March. Article 30 of the May 2009 Russian National Security Strategy states, “Negative influences on the military security of the Russian Federation and its allies are aggravated by the departure from international agreements pertaining to arms limitation and reduction, and likewise by actions intended to disrupt the stability of systems of government and military administration…” The Russian invasion this past weekend is blatant flouting of international law. It is also a long-planned intervention that has been sitting in the files of the Russian Defence Ministry since at least 1991. The grand strategic reason for the intervention is the determination of Moscow to reassert control over what it sees as Russia’s “near abroad” with Ukraine as its lynchpin. However, there are five additional reasons why Moscow has seized the collapse of the Yanukovich regime as the moment to intervene – history, military strategy, military capability, politics and opportunity. History: Ukraine has always had a strong pull on the Russian mind as it is the spiritual home of the Russian Orthodox Church. In 1954 Ukrainian-born Soviet leader Nikita Khrushchev handed ‘control’ of the Crimea to the Ukrainian Soviet Socialist Republic. As Ukraine was then firmly under Moscow’s control the transfer mattered little, although it did mean the de facto shift of ethnic Russians and Tartars under the nominal administrative fiat of Kiev. On Ukraine’s independence from the Soviet Union in 1991 the transfer became a matter of both historical and strategic import to Moscow. ‘Loss’ of Ukraine to the EU (and eventually NATO) would be the final humiliation to the Kremlin following two decades of perceived retreat since the end of the Cold War in 1989. Military Strategy: One of Russia’s long held strategic mantras has been the need to maintain a warm water naval base that could enable Russian influence in the Mediterranean and the Middle East. Sevastopol has long provided just such a facility for the Black Seas Fleet, which is in fact the Russian Mediterranean Fleet. The nature of the Russian military operation this weekend and the use of Special Forces to establish a bridgehead at Simferopol and Sevastopol Airports are indicative. They point to a classic Russian expeditionary operation that creates and exploits local unrest to enable seizure of the seat of government as well as control of land, sea and air space. The initial aim is to secure the Sevastopol base and its lines of supply and re-supply with Russia. Military Capability: In 2010 Russia announced it would inject $775 billion into the professionalization and modernization of its armed forces. This followed the disappointing performance of Russian forces in 2008 during Moscow’s seizure of parts of Georgia. The bulk of those new forces are established in the Central and Western Military Districts which abut the Ukrainian border. The kit being worn by the deployed force demonstrates a mix of Special Forces (Spetsnaz) and specialised forces and reflects the effort Moscow has made to improve deployability of its elite professional forces. Ukrainian forces have enjoyed no such modernization. In any case the upper echelons of the Ukrainian military’s command chain are deeply split, as evinced by the defection this weekend by the Head of the Ukrainian Navy. Many senior Ukrainian officers owe their appointment to Yanukovich. Politics: The Putin regime was established in 2000 and led to the cult of Putinism. It is a regime that consolidates domestic power by appealing to nostalgic Russian notions of grandeur. In particular the regime has endeavoured to recreate the sense of a Russia powerful enough to re-capture the influence Moscow enjoyed in the 1950s and 1960s at the height of the Soviet Union’s super-power. The 2014 Sochi Olympics were very much part of the regime’s image-building. In 2013 US Secretary of State John Kerry gave equal billing to Russia in the handling of the Syria crisis and enhanced the reputation of the regime at home. Opportunity: The Kremlin under Putin is first and foremost a strategic opportunist. The withdrawal of two US Brigade Combat Teams from Europe may seem small in and of itself. However, taken together with the ‘pivot’ to Asia and President Obama’s uncertain grip of grand strategy the US is no longer the stabilising force in Europe it once was. The Kremlin also has contempt for ideas of ‘civil power’ built around Germany and the EU. Moreover, Russia’s military renaissance has taken place in parallel with the West’s failures in both Afghanistan and Iraq. The Kremlin is also acutely conscious of Europe’s economic travails and de facto disarmament with total defence spending in Europe down by minus 1.8% per annum since 2001. Moreover, the refusal of all but two NATO European states to meet their obligation to spend 2% of GDP on defence has also led Moscow to conclude that Europeans lack the will and capability to block Moscow’s regional-strategic ambitions. Implications for Russia and Ukraine: The seizure of parts of Ukraine will in the short-term strengthen the grip of Putin over Russia. However, Russia faces deep demographic and economic challenges which unless addressed will see Russia continue to fade as the West, China and others eclipse Moscow. The east of Ukraine is very vulnerable. Moscow has a cynical view of the use of power and will almost certainly use the concerns of ethnic Russians to justify an intervention that would straighten Russia’s strategic borders and thus consolidate the new Russian sphere of influence. Recommendations: There is no quick fix available to Western policymakers. However, Western allies must use all the non-military tools at their disposal to force the Kremlin to reconsider the costs versus the benefits of such action. That will include use of international fora to build a countervailing coalition, possibly with China which dislikes sovereignty grabs. All economic tools must be applied with sanctions imposed on key officials, with Aeroflot flights to Europe and North America suspended and Gazprom slowly removed from the European market. The accounts of senior Russians outside of the the country must be frozen. Finally, the US must re-position forces back in Europe, including the Baltic States and Europeans must commit to the re-building of their armed forces. Conclusions: Over the medium-to-long term NATO allies must re-establish credible defence as part of a balanced economic, diplomatic and military influence effort in and around Europe. 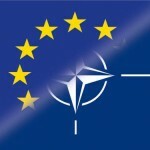 Former US President Bill Clinton and former US Ambassador to NATO Nick Burns said yesterday that the enlargement of NATO to former members of the Soviet Bloc guaranteed their security. This is correct to a point. Without the modernisation of Article 5 collective defence the value of NATO membership will over time erode and if Putin remains in power the Kremlin will exploit such weakness. The Politics and International Studies Department at Warwick is delighted to announce an upcoming conference entitled ‘Spy Chiefs: Intelligence Leaders in History, Culture and International Relations‘. The conference will be held on May 6th and 7th in Warwick’s Venice-based conference facility, and will feature keynote speeches from Tony Mendez, the CIA agent who the film Argo is based upon, and Professor Christopher Andrew, Intelligence historian at Oxford and former Official historian for MI5. The papers and panel discussions held within the conference will focus around the following set of issues. In many countries today spy chiefs are the public face of intelligence. They speak to the media, appear before public inquiries and committees, and even write books. This has not always been the case. In the United Kingdom, for example, heads of agencies were historically appointed in secret, their names and roles not officially disclosed to the public. This international conference brings together leading academics and practitioners from across the world to broaden and deepen our understanding of what makes an intelligence leader.